Not all varieties of lavender are started from the seed. True lavenders such as "Munstead English" can be started from seed , while lavandins are always propagated by cutting as the plants don't produce true seeds. Direct seeding can be done in the spring as early as the soil can be worked; it can also be done in the fall as the seeds will benefit from a period of cold to increase germination rates when temperatures warm. 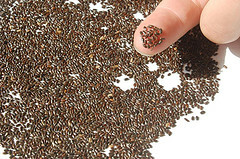 Sow the seeds about an inch apart and no more than ¼ inch deep as light helps germination. Keep moist but not soggy. Room temperature (about 70°F) is optimal. 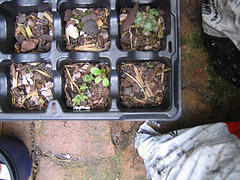 Be patient, as lavender is unusually slow to germinate, sometimes taking up to a month to emerge from the potting mix. If starting lavender from seed is not practical for you, lavender seedlings are widely available and can save lots of time in getting your lavender beds established and productive. It is possible to buy fresh and dried lavender stalks or dried flowers alone. But it is cheaper to grow your own lavender. Even if you do not have a garden, you still can place them in a window boxes or sunny spot in a patio. This will give you lavender for several projects. You will then be able to make potpourri, fragrance sachet bags, and other items. There are 2 things to make lavender gardening successful : sun light and good soil drainage. Mediterranean in origin, Lavender does best in a dry, sunny position and free draining stony or sandy soil. If you are growing lavender in a container or window box, mix the potting compost with peat or coarse sand. Heavy, waterlogged or very rich soil is unsuitable. Check the soil's pH to make sure it falls somewhere between 6.5 and 7.5. If the soil is too acidic the Lavender will not thrive. If the soil is too alkaline, the nutrients are 'tied' up in the soil and the plant cannot use them. Yellowed growth can be indicative of a soil that is out of balance. Adding compost can help to balance the pH. 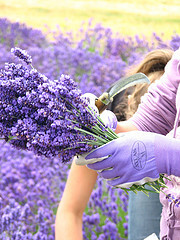 Lavender grows best when the soil has potassium and high lime content. Avoid using excess amount of fertilizers including nitrogen based types and never uses strong manures i.e. pig or chicken. Usually lavender rarely needs fertilizer. Lavender likes a well drained soil. During the summer and early fall, you will water your plant about 1 ½ gallon per week. If possible, water the plant with drip irrigation. Watering the plants from top while the plants are flowering could damage the flower. Although lavender is moderately hardy, some species such as lavandula stoechas need extra winter protection. Dwarf forms, such as hidcote make excellent hedges for paths, borders or herb gardens or mini hedges for sunny window boxes. For a hedge, allow 12-18 inches (30-45cm) between plants, depending on the variety. Lavender is ideal for sunny patios where the reflected heat from the paving intensifies its fragrance. Lavender needs little care once it established. It flowers profusely in summer. If you dont harvest the flowers, deadhead after flowering and trim hedges lightly. In spring cut out frost damaged growth. Old, leggy plants can easily be replaced with semi ripe cuttings taken in midsummer. Harvest lavender just as the flowers start to open. When it is the right time to harvest lavender? For harvesting the flower, look closely at your plant. You will notice that the stem has 3 colors. The top is darker green, the middle will be lighter green and the bottom brown. Cut the just above the lighter green area. Do not cut the brown area. This is where the plant will regenerate. The best time to harvest lavender for sachets and potpourri is when the flowers on the stalks are starting to open. Lavender should be harvested in the morning when temperatures are cooler, as the heat of the day causes the fragrant oils to dissipate. The faster lavender dries, the better the colors of the flowers and the fragrance will be preserved, so try to harvest them after the dew has dried from the stalk. For its buds, you should harvest at the right time, to maximize the fragrance. Use this picture to guide you. If there is a sunny spot on the walkway to your house, that's an ideal place for a potted lavender or bush because its fragrance will surround you each time you arrive and leave. A complete guide to this favorite aromatic herb. How to grow and harvest with unusual ideas for using in the garden landscape. New designs using both dried and fresh cut lavender, include a lavender stack and a Christmas tree. Make potpourris, garlands and arrangements, lavender spiced potato salad, chicken, lemon bread and more. Handy resource list includes the best mail order nurseries for lavender; one with 66 varieties. If you are going to buy just one book on lavender, then this is the one. Woody perennial. Sow in flats and keep in partial shade, or sow dry seed in the fall or early spring in outdoor nursery beds. Transplant to pots or out to the garden after the slow-growing seedlings produce 4 or 5 leaves. Lavender prefers a moderate supply of nutrients, lime and a well-drained soil. Drought tolerant. We offer only heirloom, open-pollinated varieties that produce the highest quality of essential oils. Do not be fooled by fancy hybridized varieties that are clones, make sterile seed and produce inferior essential oil!